The 5-mile trail network in consists of interconnecting loops which lead you along the lush greenery of Oak Creek and the famed red rocks of Sedona. The family-oriented trail system is also well marked for your safety and pleasure. The Eagle's Nest Loop and the Apache Fire Loop are joined together by the Coyote Ridge Trail which creates one of the best trails in Arizona for family enjoyment. Eagle's Nest is the highest point in the park with an elevation gain of 300' and offers amazing views of the red rock escarpments that have helped catapult Sedona into a worldwide destination. These three major loops are connected along the riparian corridor by the Kisva Trail, which also leads up to the short loop of the Yavapai Ridge Trail. 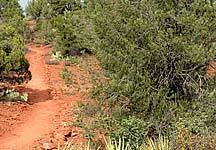 The Javelina Trail takes you into the pinyon/juniper woodlands and back to the other loops. Stop by the visitor center desk for detailed information before starting out on the trails. Bikes and horses are only allowed on designated routes. Red Rock State Park offers limited equestrian trails in the park, however it does provide access to several Forest Service trails located nearby. The Lime Kiln Trail is located near the park entrance and the Turkey Creek trail is located at the park’s east gate. Horses should follow the painted horse tracks on paved roads. There is a hitching post located near the Visitor Center. While most trails in the park are off-limits to bicycles, there is access to several popular Forest Service trails from within the park. The Lime Kiln Trail is located right outside the entrance to the park and there are various trails located outside the park’s east gate. A common route taken by bikers is the 6.2-mile Cathedral Bike Loop, which takes you out of the park via the east gate, down Verde Valley School Road, across Oak Creek (no bridge) and back to the park’s entrance on the Upper Loop Road.